Our family loves space! We love looking at the stars, learning about the planets, and watching the International Space Station fly through the sky. 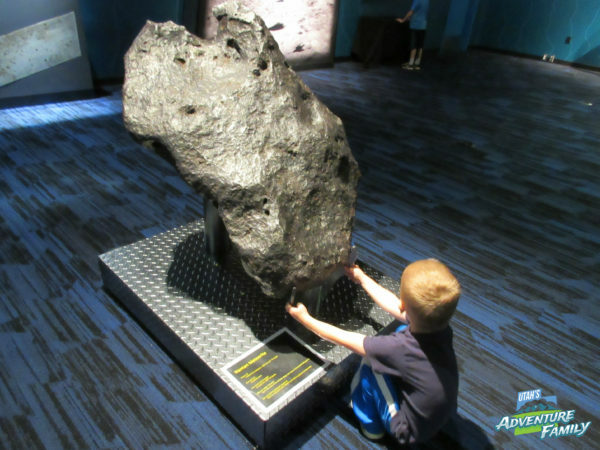 So it makes sense that one of our favorite places to visit is the Clark Planetarium. 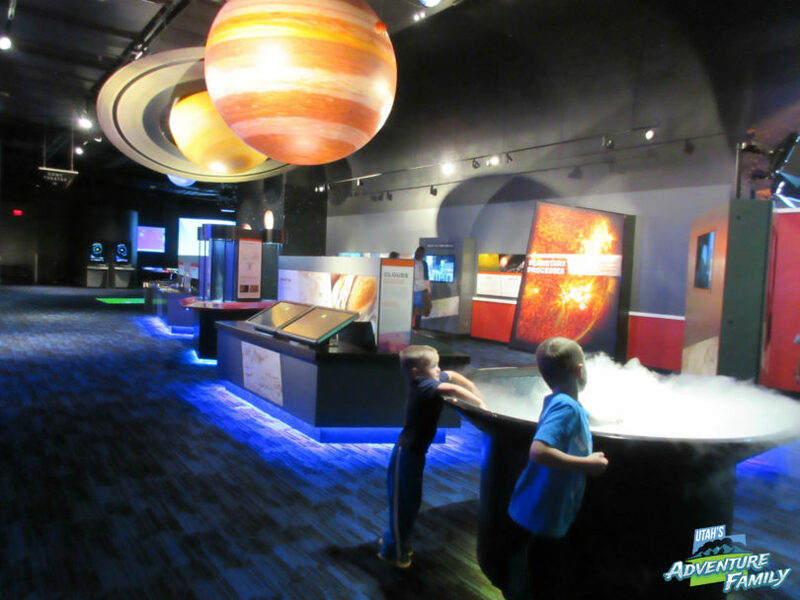 The planetarium just got a makeover, so we went to check it out! 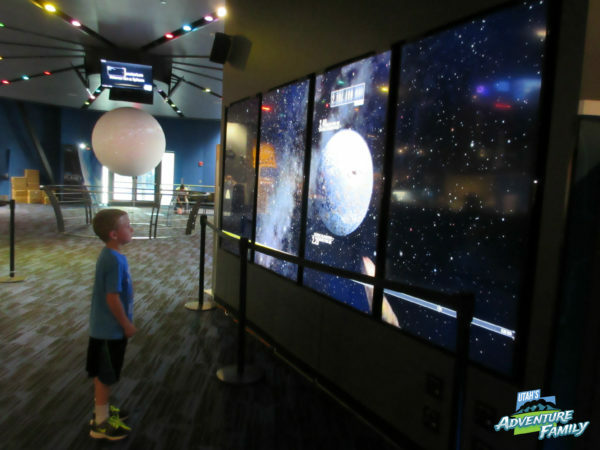 Clark Planetarium is FREE! 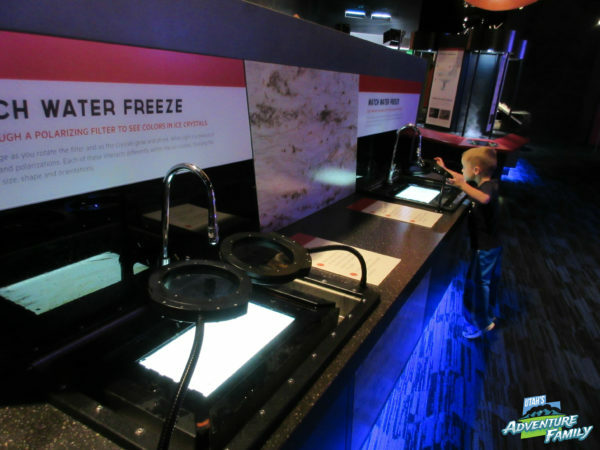 You can walk through the exhibits and do all the experiments for free, and we love that! There aren’t too many museums like this that don’t have a fee. 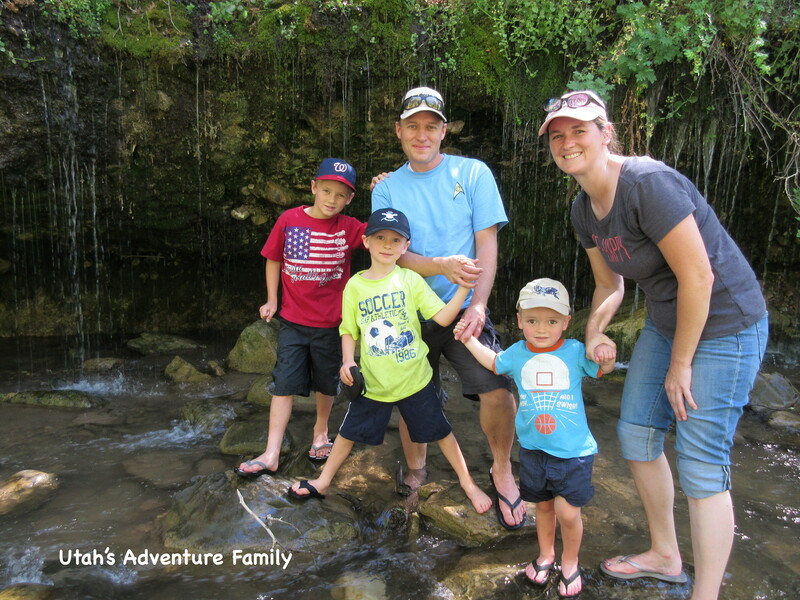 They have movies and light shows in their dome theater that cost, but we usually skip those to keep our adventure really cheap. You do have to pay for parking at the Gateway. We paid $1 because the first hour is free and the next hour cost us $1. 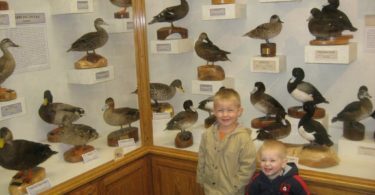 The new exhibits are very hands-on, which was really fun for all of our boys no matter the age. On the first floor there is a large earth in the center of the room. 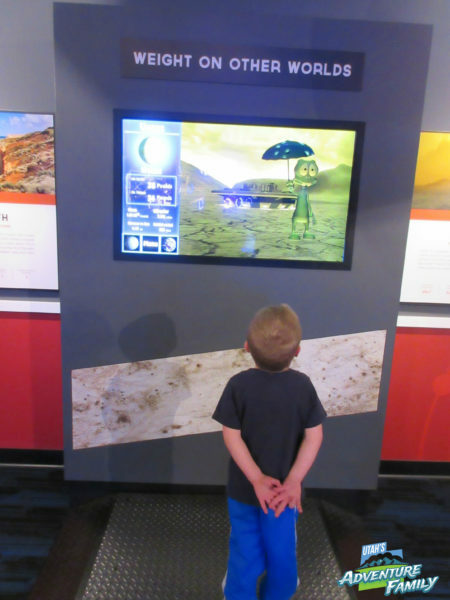 There is also a desk to buy tickets to the shows, a gift shop, and my boys tried to land a lunar rover on the moon. 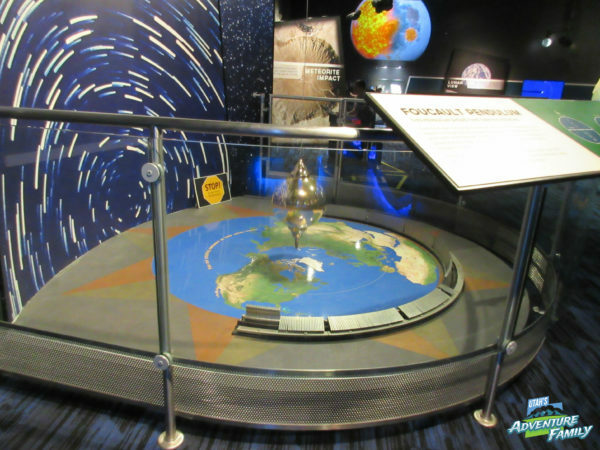 There is also a smaller area on this level where you can see the Foucalt Pendulum that has been at the Clark Planetarium for ages, as well as meteors, and a few other exhibits about earthquakes, lightning, and the moon. You will make your way to the displays on the first floor. These screens show how the earth and moon have changed over billions of years. This is the room on the first floor that you will want to explore. My boys loved defending the earth in this game. Mostly because you got to shoot asteroids. This meteor weighs more than a VW beetle. The pendulum is still at the planetarium. We were glad! On the second level there is a small snack bar where you can buy some food (you can also buy food at the restaurants in the Gateway). 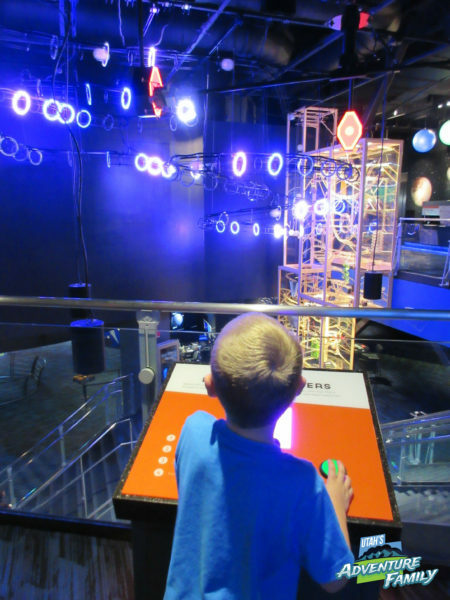 Near the snack bar is the entrance to the dome theater and also a few interactive screens where you move your arms to affect the Aurora Borealis or the planets. You will also find the bottom of Newton’s Dream. 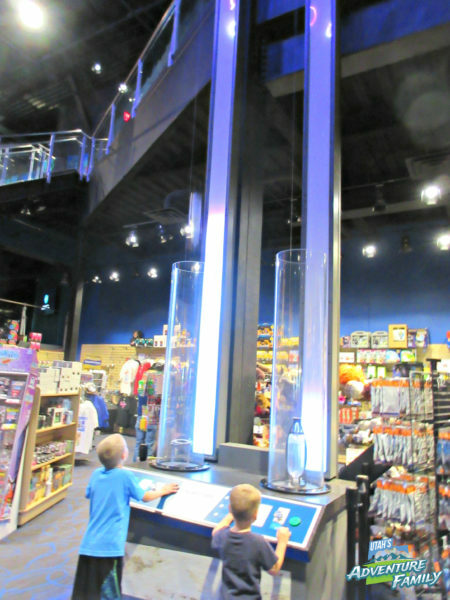 It is an audio-kinetic sculpture that extends from the 2nd level up to the 3rd. 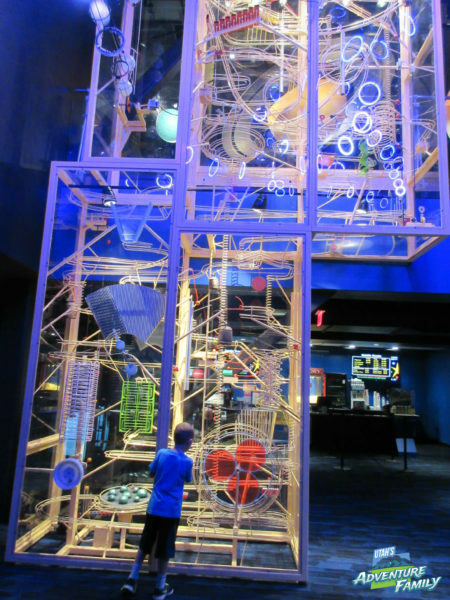 We spent a lot of time watching this sculpture, and there are also levers that the kids can turn to change the different mazes for the balls to travel through. This is definitely one of the highlights at the planetarium. You can watch or play with Newton’s Dream on either level. This is a very fun sculpture and has been in the planetarium for awhile. All of our boys have loved watching and manipulating it. These screens are near the theater. You use your arms to move things on the screen. 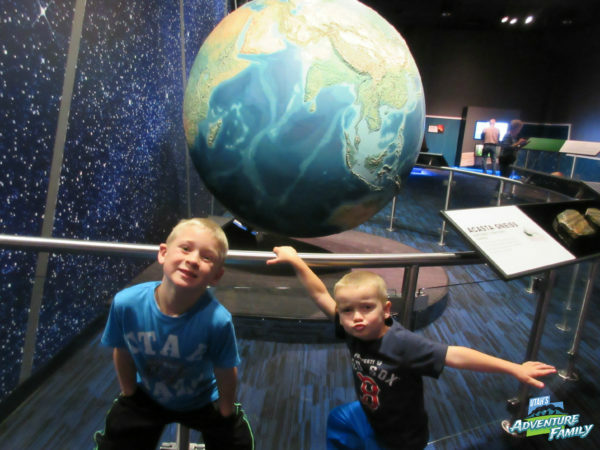 The third floor has most of the exhibits and we spent most of our time at the planetarium. 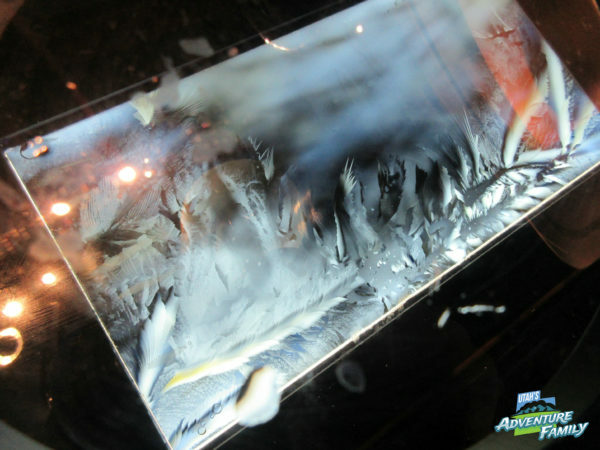 There are fun science experiments to try such as making a tornado, or watching ice freeze, or figuring out how much you would weigh in different places in space. 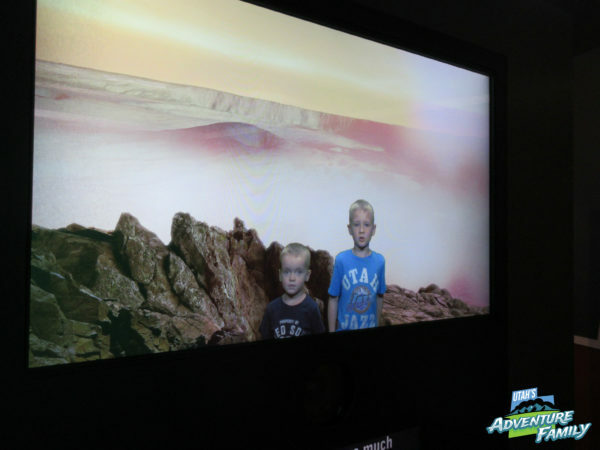 Our boys liked forecasting the weather for different planets next to the green screen, and I was fascinated with the different smells from space. We also tried to land a Mars rover on a bullseye, built rockets and flew them into space, and found blackholes. It was so fun! The third floor has lots to explore. We just read a book about tornados, so this was a perfect experiment to wrap up what we learned. My boys always love this one. You can see what you would weight in different atmospheres! I loved this experiment. You watch as the ice freezes across the surface, but the light behind it brings out these cool patterns. It was awesome. This is the ice working it’s way across the surface. I was so interested in this. 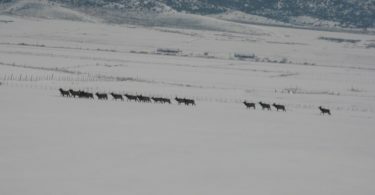 Does it look like they are on IO? You’re right! In front of the green screen there is a teleprompter for your kids to read the weather report for which ever location they choose. We did all of them, of course! 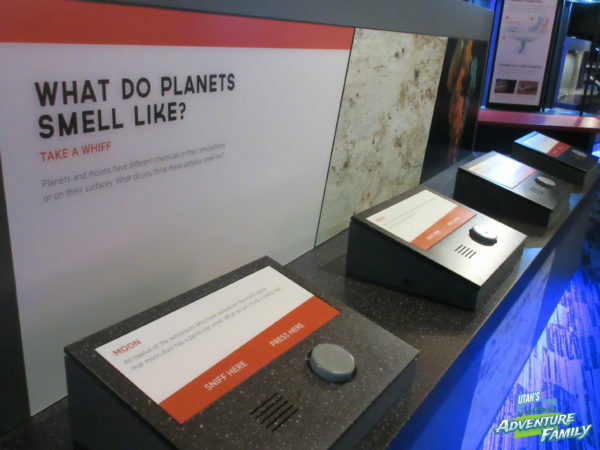 I hadn’t really thought about smells in space, so this display was fascinating. We liked trying to land the rover onto those red bullseyes without gravity. You have to use your thrusters, and watch your fuel levels. There is obviously information everywhere to help you understand what is happening as you play with science. 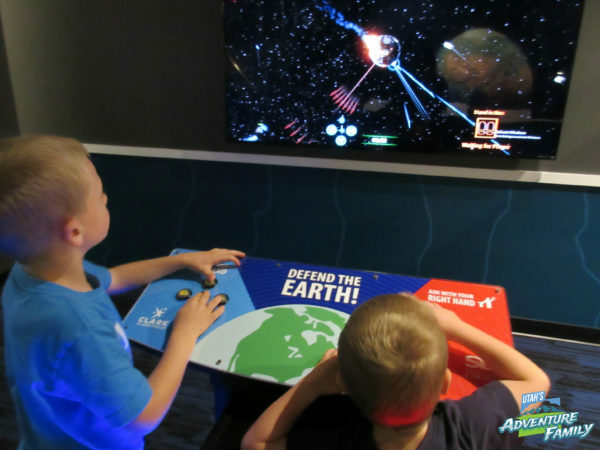 A lot of the exhibits are with touch screens so you can virtually practice doing different space activities. 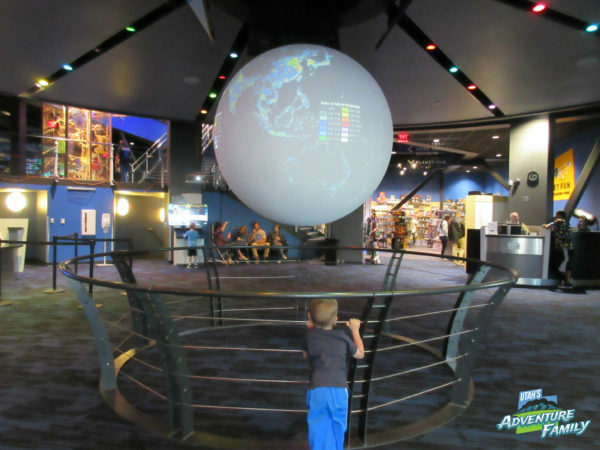 They have definitely moved Clark Planetarium up into the technological world. This was the favorite spot where you could build your own rocket and then try to launch it into space. 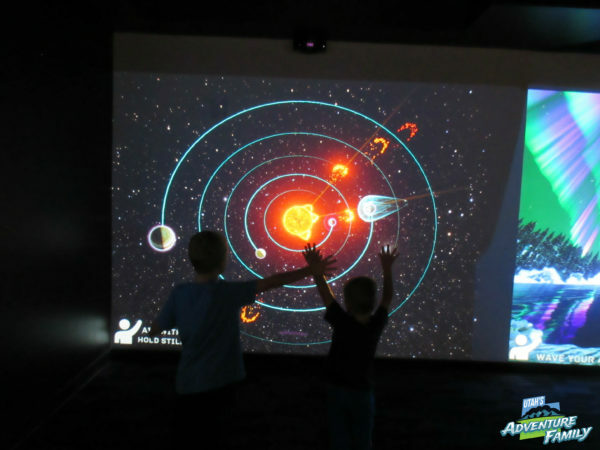 One of the best new parts of the planetarium is the Kid Space, which is a play area for kids (and adults). 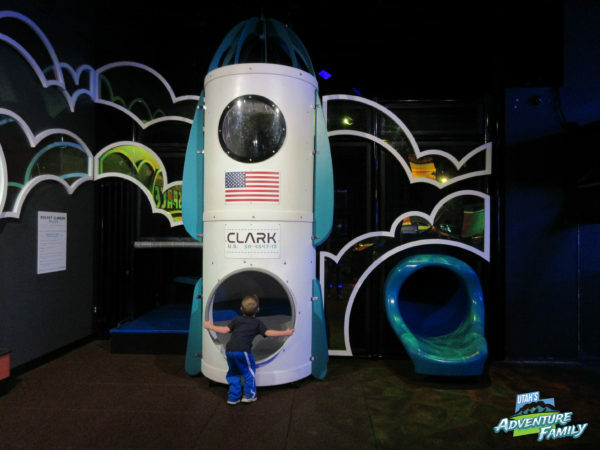 There is a rocket to climb into, and a slide, but if you climb inside you will find lots of tunnels, and fun places to explore. My boys played here at two different times and they loved it. 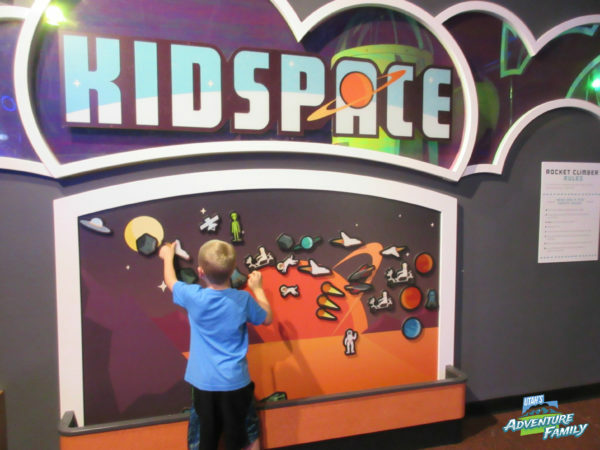 The KidSpace has magnets so that your kids can create their own space picture. When we first walked over, we thought it was just the slide and rocket, but there is a ton of climbing space behind the rocket. My boys loved exploring back there in the dark! 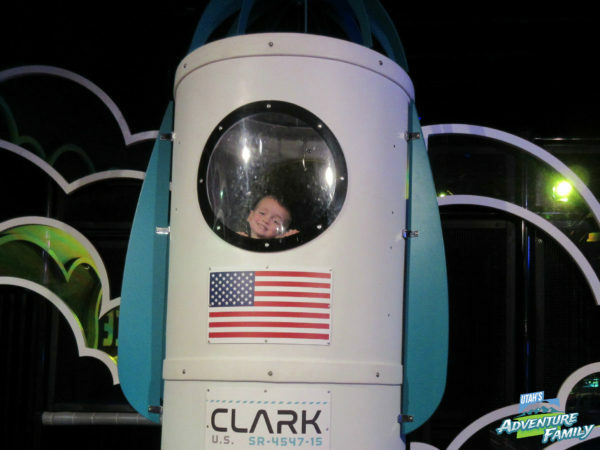 They also liked being astronauts in the rocket! Clark Planetarium is definitely worth a visit. It is great for all ages. 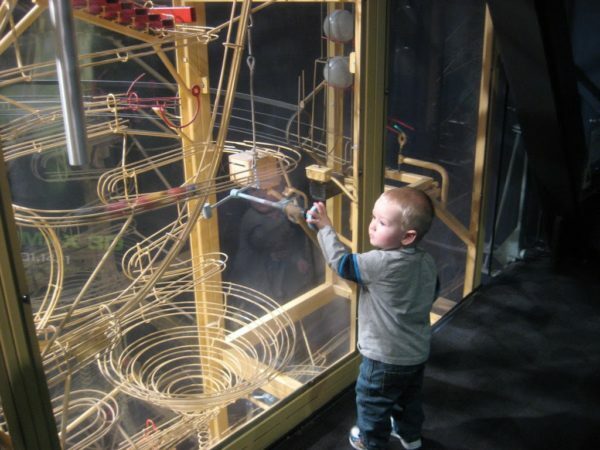 You might need to help your little one participate in some of the experiments and work the screens, but our four year-old did really well on his own. I had to drag the kids out to the car and only after I promised we would come back on the weekend with their father, and I think I had more fun than they did! 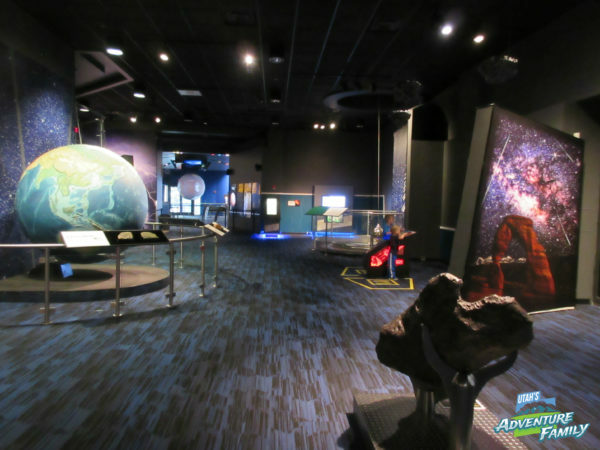 If you are looking for a fun place to spend a few hours for FREE, visit Clark Planetarium. 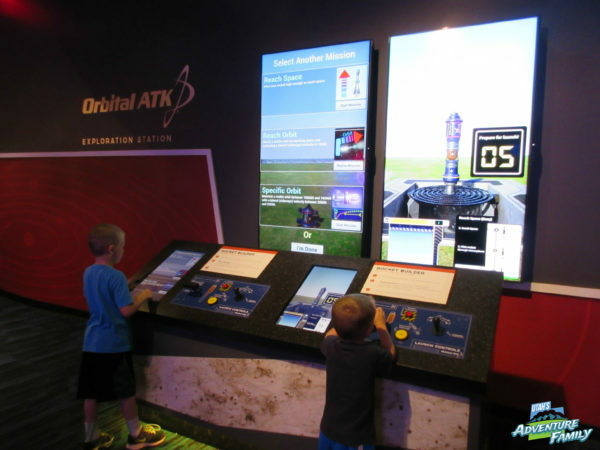 This rocket launching exhibit is next to the gift shop, so we don’t want you to miss it. It is a fun one to try! 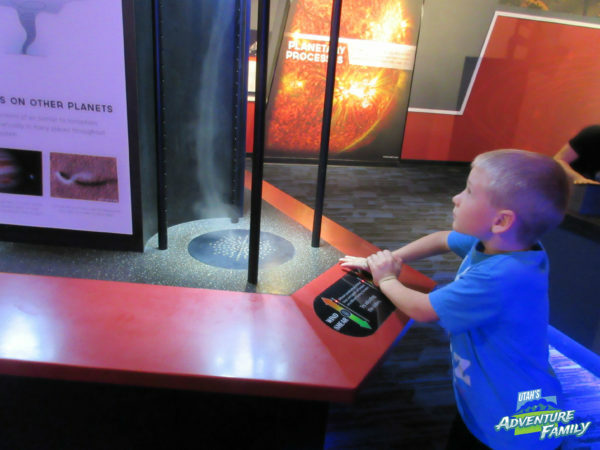 This picture is from our first trip to Clark Planetarium about 6 years ago, but you can see that Newton’s Dream was still a popular spot! When did you go there? I want to go, because I love space, not for my kids. Looks like fun!